18 Week Bump Report AND Gender Reveal! Last week, we had a little fun with gender myths and predictions. In fact, I asked for your predictions of my baby. The poll seems to have disappeared (although I didn’t take it down), but I do remember that over 60% of the vote was for a girl. I have a feeling that if you’re reading this today…you’ve come back to find out how accurate your prediction was. I’m afraid you’ll have to wait a little longer…at least until you get further down into this post. Before we get to the “Big Reveal,” let’s go through my 18 week stats. How big is the baby: About the size of a sweet potato. In fact, a sweet potato with cinnamon sounds really good right now. Total weight gain: I’ve been fluctuating between a 1/2 and 1 lb over the past couple of weeks, but during my weigh in this week…I showed no weight gain (in fact, if I took off my shoes, I weighed even less). Therefore, I guess I’m still at 6 lbs gained. Sleep: Not too bad, but I’m considering finally using the body pillow my coworker gave me a couple of months ago. When she gave it to me, I tried sleeping with it once and it was just too much. However, I’m getting to a point where I could use a little extra support. Best moment of the week: Feeling our baby move. I thought I felt our baby moving last week during a conference. I felt a couple of light kicks around my belly button for about a minute then it went away and didn’t return for about a week. On Tuesday, I started feeling it a little stronger. I could almost imagine the baby moving in my belly. I’ve previously not known the difference between gas and movement, but gas hurts…baby doesn’t. It was also pretty awesome to see our baby on screen during our anatomy scan. The baby has grown so much since we last saw him/her on screen in January. And that heartbeat…never a sweeter sound has ever played. I almost wanted to bring a bag of popcorn, sit back and enjoy the show…had the baby been more active of course. Food cravings: Nothing in particular. Actually, I don’t really care what we eat as long as we eat…although I’m still grabbing for fruits if I want a snack vs. sweets. My energy level seems to be up if I stay away from anything too sugary. My skin is starting to clear up. I found that using a little bit of witch hazel after washing my face seems to calm my cystic acne. The round ligament pain has also calmed down quite a bit since the other weekend. I’m sure our baby was just going through a bit of a growth spurt the other weekend when I was feeling all that pulling in my sides. Now, I only feel it occasionally when I get up or move the wrong way. My baby bump is becoming more defined. I’m still pretty small and still fitting into my pre-pregnancy pants, but I think it’s finally time to invest in a few pairs of pants to get me through the rest of my pregnancy. 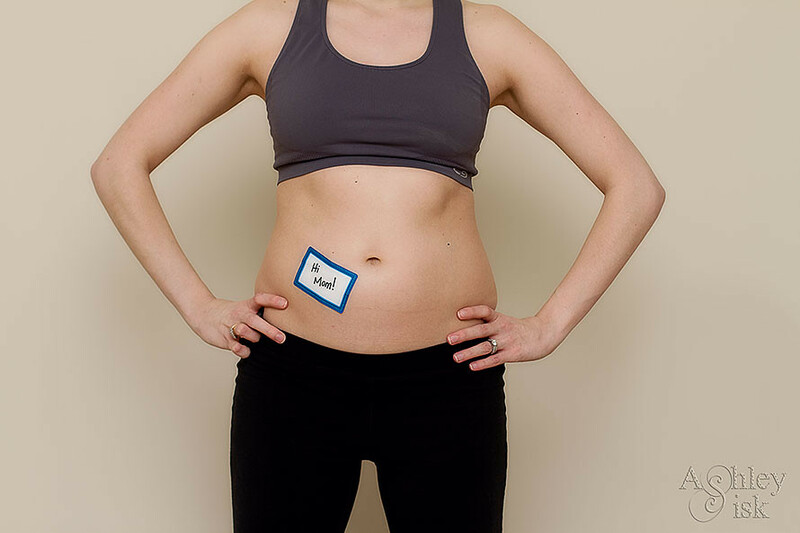 The only reason I’ve been resistant is because I don’t know exactly what size I’ll need, and quite honestly, that band over my belly is not always comfortable. Gender: Yesterday, I went in for my 18 week anatomy scan. My appointment was scheduled for 9:45 am, so I decided to come into my office first to start my day. My doctor’s office gave me no special instructions, but I’d heard that it’s helpful to drink a little coffee or orange juice to get the baby moving. So…I had half a cup of coffee (to avoid too much energy) and a bottle of orange juice before leaving for my appointment. I think my timing would have been alright, but if you follow me on Twitter – you know that the sonogram technician was running a little bit behind. Actually, about an hour behind. Do you have any idea what this does to an anxious new mama? Oh the nerves! Of course by the time the sonogram tech brought us back for our ultrasound, I knew my baby would be taking a nap. I almost did jumping jacks to get them up and moving again. And I was right…well not taking a nap, but laying face down in a chilled out position. The tech decided that she would go ahead and take measurements, leaving a look at the gender parts last. I’m happy to report we have a healthy 8 ounce baby…and that’s the most important thing. The good news is that we WERE ABLE to find out the gender of our baby. But, before making my big reveal, let’s revisit the myths and old wives’ tales (OWT) one more time. Click HERE to see full explanations and commentary. Carrying high or low? I think it’s still too soon to tell, but right now it feels low. Myth/OWT would say boy. Fetal heart rate? Just yesterday, baby’s heart rate was 135-138 bpm. Myth/OWT would say boy. Husband’s weight gain? Although he’s eating a lot of snacks at night (and sweet ones at that), he’s been maintaining his weight…but so have I. Myth/OWT would say boy. Cravings? My cravings are mostly towards sweets, carbs and fruits. Myth/OWT would say girl. Clumsy? Not falling over just yet…unless it’s the middle of the night and I’m half asleep. Myth/OWT would say girl. Morning Sickness? What’s that…I must have missed it. Myth/OWT would say boy. Sleeping on the right or left? I tend to sleep more on the left side. Myth/OWT would say boy. Chinese Birth Chart? Depending on which method I used, one said girl one said boy. Even/Odd Year? According to this method, girl. With all that said, most of the myths or old wives’ tales pointed to me having a boy. My husband thought the whole discussion was rather silly since he was just happy to have a healthy baby, but come on now…women do love to speculate. 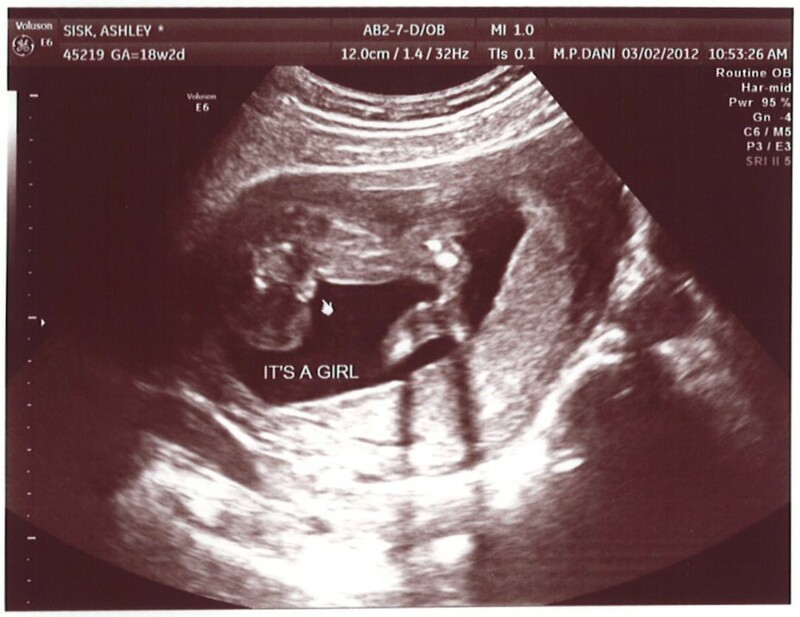 That’s right – it’s a GIRL! In case you don’t know what you’re looking at, this is what is commonly referred to as a “potty shot” taken between the baby’s legs (you can see one leg on the right side – I guess her other leg is kinda kicked out so you can’t see it). You may notice three little lines where the courser is pointing – that would be our baby’s lady parts. What I’m looking forward to: Now that we know the gender of our baby…I’m really looking forward to designing the nursery. I’ve had a general color scheme in mind for weeks now…and my mom has been pulling fabric swatches so that when we knew the gender, we could move one direction or another. I will tell you that I am not one to design a traditional pink or blue nursery…so I can’t wait until all of that comes together so I can share it with you. On the other hand, I’m sure that my husband is really looking forward to all the prep work required on his end to get that nursery in shape: painting, breaking down the bed that is in there now, moving furniture, changing out the switch-light to a dimmer, etc. What I miss: My less acne-prone skin. I’ve always had a bit of acne, but I really look like a teenage girl right now. Have a great Saturday – see ya tomorrow for Scavenger Hunt Sunday!